This acting principle was originally created by playwright David Mamet who claimed “If you look at a scene and cannot find the negotiation, the scene is in trouble”. Ed Hooks uses it in Acting for Animators and describes that overcoming the conflict and sticking to a goal without necessarily knowing the steps to get there creates greater interest. This echoes Robert McKee’s this look into conflict in his book Story: Substance, Structure, Style and the Principles of Screenwriting. 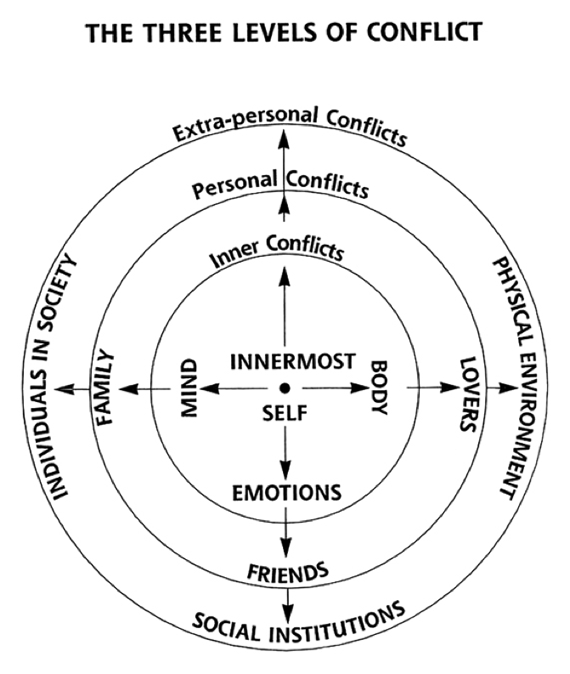 Below is a graph from that book which visualises the different levels of conflict. In the following video which I created for another project, I was very considerate in putting this particular acting principle into practice. In my previous animations I often felt I was animating actions for the sake of animating actions. Going back to my old post on Context in Animation I designed a scene around a character waking up in the morning. I didn’t think too far ahead and decided to animate it in chronological order and consider what actions to play depending on the action before it (taking into consideration the Your Character Should Play an Action Until Something Happens to Make Him Play a Different Action acting principle). The first action in the scene starts the first conflict, an obvious attempt at trying to hit the alarm clock to stop it ringing. The negotiation is simple, our character will need to leave his bed in order to have a productive day, however we relate to that morning battle where our mind still wants to sleep a bit more. The character raises up in attempt to become aware of his surroundings, he negotiates his inner conflict whether to get up at that moment or maybe lie down for another few minutes. He then attempts to sit up and succeeds this time with visible drowsiness. To add a little humour and life into the scene I then animate the character spinning around before collapsing back into his pillow for another snooze. So on the whole, our scene is a negotiation. A negotiation between our character and his thoughts, a conflict between whether to wake up or go back to sleep. His inner conflict makes the scene, it is the narrative and it gives meaning to the actions animated, telling us a little bit about his character (that most of us can relate to).